Oxford midfielder Josh Ruffels has signed a new contract which could keep him at the League Two club until 2018. Ruffels, 20, began his youth career at the U's, and after a spell at Coventry moved back to Oxford in July 2013. He has made 31 appearances for the U's this season, scoring one goal. "I have loved being back at Oxford," Ruffels told the Oxford club website. "The whole club is so positive and I look forward to coming in to training every day." U's chairman Ian Lenagan said the new deal for Ruffels was reward for his form this season and showed the club's commitment to young talent. 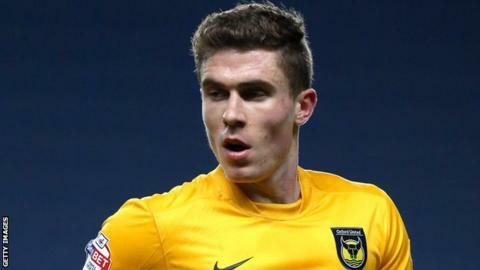 "Josh Ruffels has shown his commitment to Oxford United but we have done the same," Lenagan told BBC Radio Oxford. "It's a result of the investment we are making in the academy and the development squad." He added: "He is there (in the team) on merit and Josh in that position has become more commanding and it's important we sign him in the long term because he wants to be at Oxford United in the long term."